The guys at gearbest were kind enough to send me a Mangrove Outdoor mini backpack to check out. This backpack is made from a water resistant polyester material and has a capacity of around about 10 litres. The first thing you’ll notice about this bag is that it bears a striking resemblance to the Arpenaz 10 from decathlon. This bag however has a few subtle differences. This bags zipper into the main compartment has two zips and the zip actually is not parallel to the edge of the bag which I actually found to be a bit jarring while packing and unpacking it. I do prefer a straight parallel zip especially for smaller bags like this. It has light padding on the back and on the straps which keep it comfortable for most situations which is good. Unfortunately one of the downsides is that the front pocket isn’t pleated like on the Arpenaz 10. Which means it doesn’t expand outwards to fit more in. But overall the build quality is really good and the colour is nice too. In terms of pricing this bag comes in at around $12 AUD ($8USD) but you can use the coupon code: Packinglite on the gearbest site to get it for $5.99. 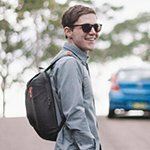 Overall a solid backpack which is just the right size for everyday carry and well built at a good price but it will probably come down to personal preference and budget with which one you prefer more between this and the Arpenaz 10.